After intensive cooperation between a group of Dutch companies, i.e. 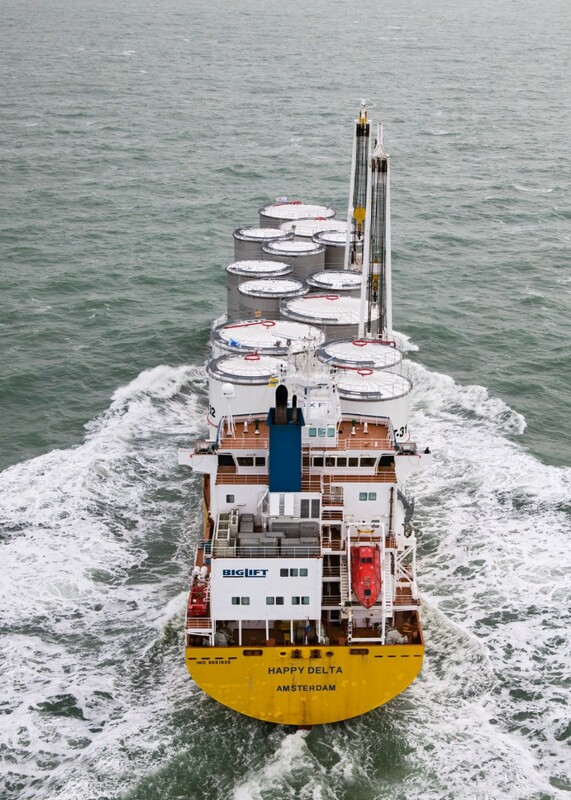 Vertom (brokers), Sloot Tankbouw (builders), Broekman (stevedores) and BigLift Shipping, the heavy lift vessel Happy Delta was loaded in February 2016 with 13 stainless steel and steel storage tanks for a Saudi Arabian client in Jubail. The tanks will be used for storage of chemicals. 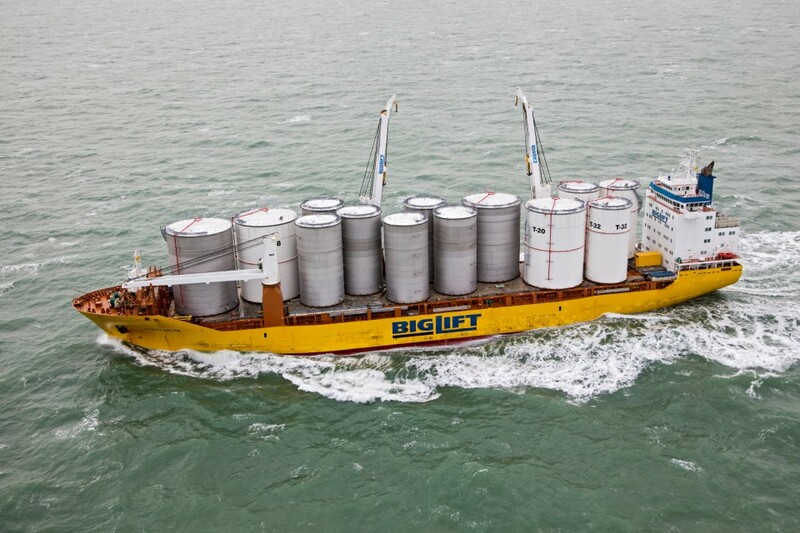 The cooperation started in February 2015 when Vertom inquired if BigLift could ship 13 storage tanks for Sloot Tankbouw; a unique project where BigLift pulled out all the stops to arrange for a nice stowage. The largest tanks weighed 106 mt and measured 14 metres in diameter and 20.8 metres in height. 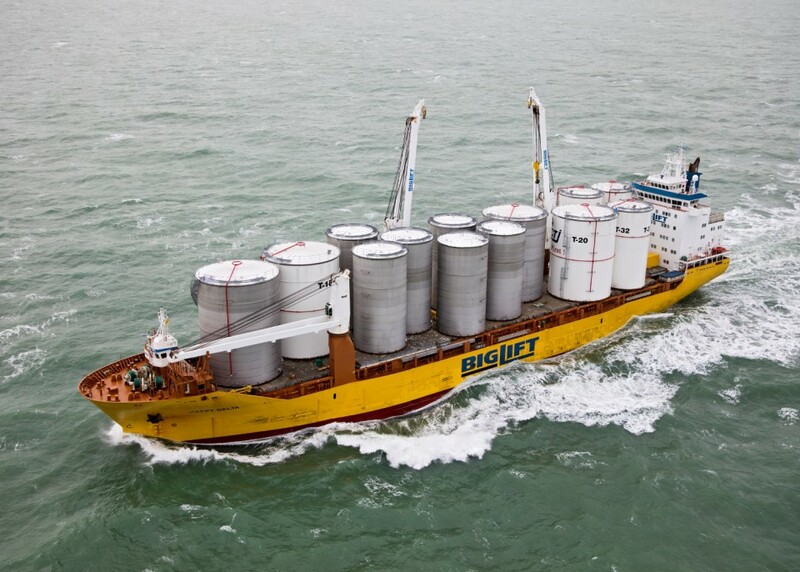 With the two 400 mt cranes of BigLift’s Happy D-type vessels, the tanks’ weight was not the issue. The total volume of 40,000 m3 weighed only 900 mt in all. 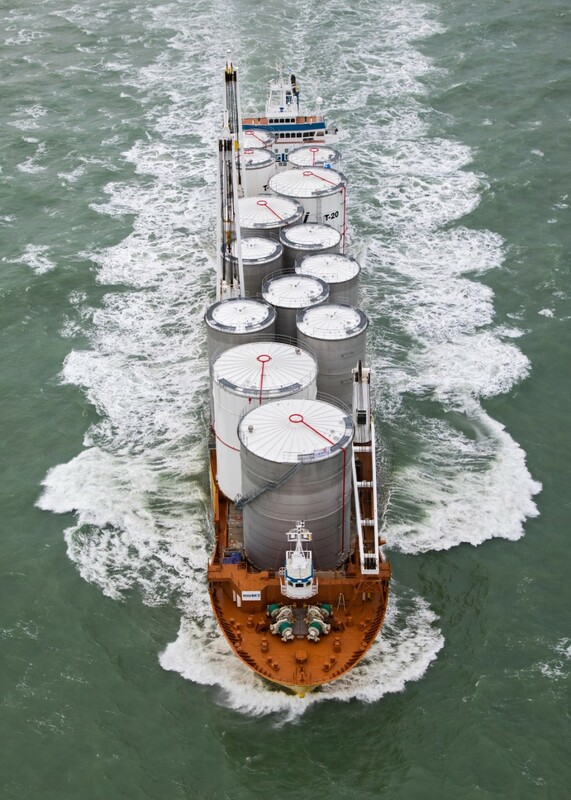 Size, construction, stowage of the cargo and the optimum seafastening system made for a complex route to the final loading operation. 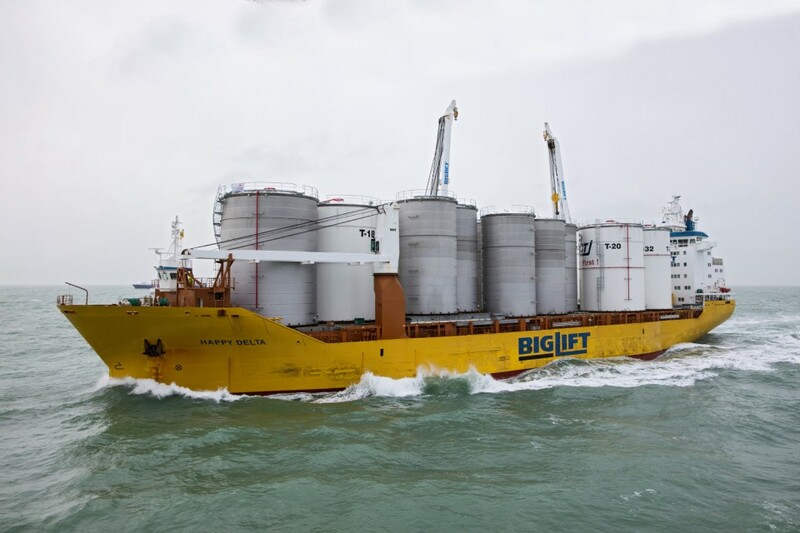 Good cooperation between builders and BigLift’s Project department resulted in an elegant solution to seafasten the fragile, thin walled, storage tanks with clips. Of the 13 tanks, six were built by Sloot Tankbouw in ‘t Zand at OTS. They were shipped in a horizontal position on barges over the IJsselmeer, through Amsterdam and by the Dutch inland waterway system to Rotterdam, a journey of two days. 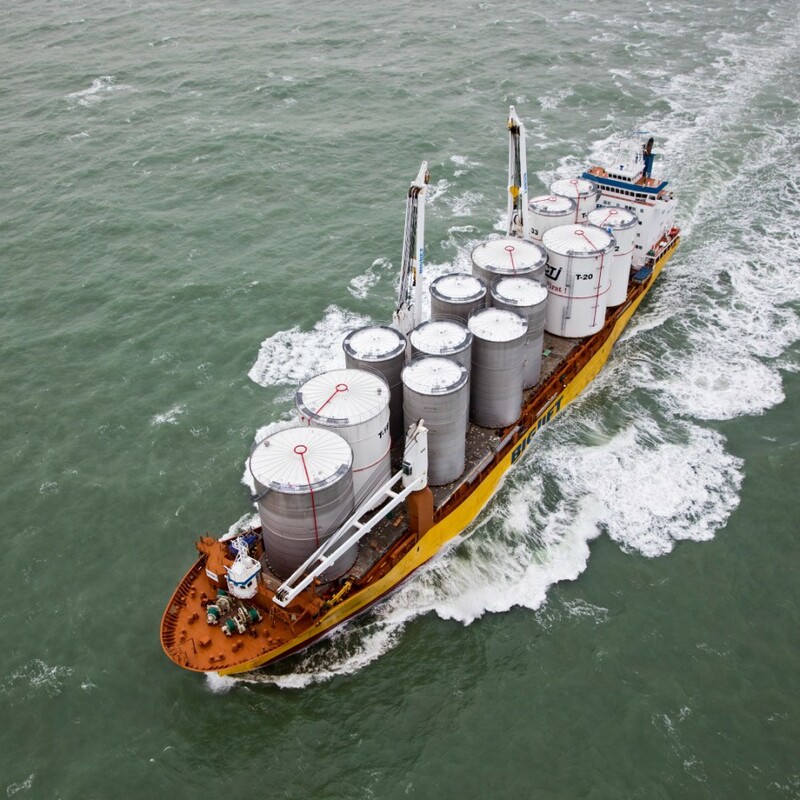 The seven other tanks were built on Sloot Tankbouw’s own yard in Bolnes, in Rotterdam, and were shipped to the Waalhaven, also on a barge, but in upright position. In the first week of February, Happy Delta, closely watched by Sloot Tankbouw and their Saudi Arabian client, loaded all 13 storage tanks. The six horizontal tanks were picked up from the barge in a tandem lift operation, turned to vertical and positioned on board. The remaining tanks were loaded in single lifts. After loading, Happy Delta travelled to Jubail in three weeks, passing the wintery, windswept Bay of Biscay and the Suez Canal. All 13 tanks were unloaded on to the quay of Jubail to full satisfaction of all parties involved.